Paul Taylor (left) and Tom Nichols (right) could return to the Posh starting line up against Bury. Posh manager Grant McCann believes a home match on Saturday (October 8, noon kick off) against the team third in League One, in front of the live TV cameras is the perfect antidote to an insipid midweek performance. McCann held a heart-to-heart with his players in the dressing room after the 1-0 beating by MK Dons at the ABAX Stadium in the Checkatrade Trophy on Tuesday (October 4), and another one yesterday (Wednesday) morning. Deon Moore in action for Posh against MK Dons. Photo: Joe Dent/theposh.com. And now he wants a positive reaction as he seeks to get back in touch with the leading pack in League One. 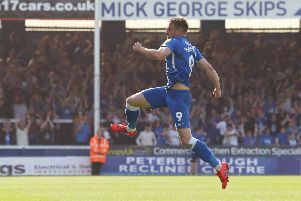 It’s a tough ask for a Posh side without a win in eight competitive matches, especially as they have won just two of nine home games in all competitions this season. Indeed since the start of last season, Posh have lost (15) more games than they’ve won (14) at the ABAX. “Bury has become a very big game for us,” McCann admitted. “But it’s also an ideal game. We’re playing at home against a top side in front of the live TV cameras so motivation won’t be an issue. “We need to get our season going again and we need to start a winning run at home. “There’s no question we are good enough, but we need to start proving it. McCann would not be drawn on team selections of formations. His biggest issue is up front with neither Paul Taylor or Tom Nichols in any sort of form, a fact that persuaded the manager to hand a first start to 17 year-old striker Deon Moore against MK. “It was a very tough night for Deon,” McCann admitted. “But he received precious little support from those behind him. “The gameplan involved Gwion Edwards, Marcus Maddison and George Moncur getting closer to Deon, but it just didn’t happen. “It was a disappointing night all round, but one thing’s for sure, Deon does not need to worry about his future. It’s likely Nichols will be restored to the Posh starting line-up for the visit of Bury. Right-back Michael Smith is away on World Cup qualifying international duty with Northern Ireland so Hayden White will continue to deputise.